After a first-round cut-off score of 76.00 points, the top 14 ponies were combined from all three sections and invited to jog to determine who would return for round two. Of the 14 to jog, 12 pairs were asked to learn Danny Moore’s handy course which consisted of a trot fence and several rollbacks where riders could display their pony’s handiness. Of the 12, only Carolyn Colter and So Enchanted returned to represent the small pony category. Colter and Ticket To Ride LLC’s nine-year-old Welsh Pony Cross (Maple Side Mr. Magic x Sophisticated lady) earned 78.00 points in their second effort and finished third overall with 157.5 points. The second place award went to Mae Mannis with Ashland Farm’s Mind Your Step on a total of 161.75 points with scores of 77.75 and 84.00 being combined. Mannis and the 19-year-old Dutch Riding Pony were one of only four medium pony combinations asked to return for the handy portion. Cecelia Perry and Winter Teitjen’s Pokerface were one of the final teams to go as the large pony division was last to return. She and the 10-year-old Dutch Riding Pony (The Braes My Mobility x Rieke) shot to the top of the leaderboard after securing the highest-scoring second round of 87.00 points. Perry only began working with the gelding several months ago before the start of the 2019 winter season and said that her main goal for the derby was just to make sure they both had a positive experience. 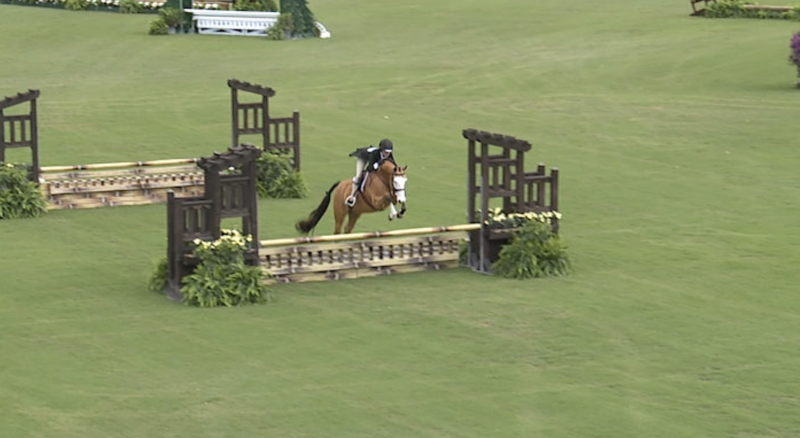 Perry said that while her main focus was making sure he willingly went over all of the fences, especially the second fence in the handy which several ponies had trouble with, she had full faith in Pokerface because he has always stepped up to the plate. See Cecelia Perry’s winning round! Click to watch.